Visiting angler Greg decided to visit the beautiful Chiang Mai region in Northern Thailand in search of wild Giant Snakehead on a lure fishing safari. After pre planning his Thailand Snakehead fishing trip well in advance and intending to fish the River Ping National Park, unseasonal heavy rains and severe flooding caused him to relocate to the stunning setting of Sirikit Dam. On arrival at Sirikit Dam in Northern Thailand on the first day weather and water conditions looked much more suited to Snakehead fishing. The angler wasted no time in boarding his personal fishing boat before beginning to explore the vast reaches of the natural reservoir. Greg started to make exploratory casts amongst submerged trees and other potential holding areas with various lures in an attempt to hook one of the elusive and predatory snakeheads. With weather conditions not perfect and a cross wind making casting not particularly easy Greg expertly cast his artificial lures searching the vast reservoir for his target species. Throughout the days snakehead fishing Greg fished exceptionally well landing several small Giant Snakeheads before retiring to his overnight accommodation in a floating bungalow on the lake. 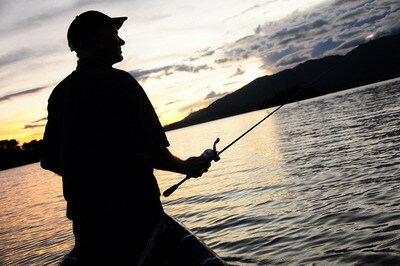 The second day of his Giant Snakehead fishing safari saw Greg up at the crack of dawn eagerly hunting the snakeheads. Greg faired slightly better on the second day after moving to a less accessible part of the vast reservoir and caught better sized Snakeheads with the best Giant Snakehead weighing a satisfying 4kg’s. After spending another night in a floating bungalow he third day of fishing at Sirikit Dam saw the experienced lure fishing fan once again amongst the better sized predators with several more Giant Snakehead landed to 4kg’s. 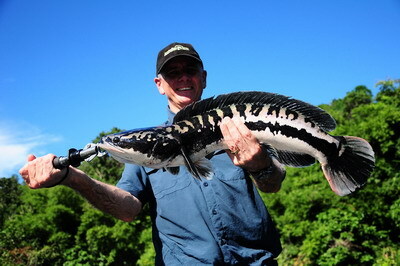 After successfully catching several decent Giant Snakeheads during his trip the angler’s fishing safari ended. Just over a week later the dam wall at Sirikit Dam became fractured due to holding excessive amounts of water from the extreme flooding further North bringing fishing to a temporary halt on the reservoir.